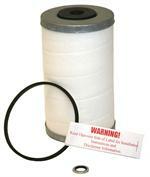 Replacement Element for the FS-2500 Bypass Oil Filter System. NOT INTENDED FOR MARINE USE. CALL 888-440-9056 TO ORDER FOR MARINE APPLICATIONS.